Black Friday sales aren’t solely about electronics and slow cookers. Pretty much anything and everything you can imagine goes on sale for Black Friday, and that includes entertainment. This year, we’ve sifted through all the sales we could find and come up with two Black Friday 2018 deals we believe to be the absolute best in entertainment. 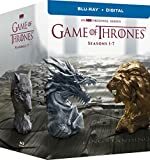 First, you can get Game of Thrones: The Complete Seasons 1-7 on Blu-ray and digital for just $74.49, a deep discount from the regular price of $120. If you want a deal that’s a bit more magical, Harry Potter: Complete 8-Film Collection on Blu-ray is now just $47.96 on Amazon, down from $100! Both of these deals are limited-time offers, so definitely take advantage — especially since the premiere of the eighth and final season of Game of Thrones is so close!